Icy gusts will make it feel close to -16C (3.2F) across Scotland while even southern England shivers in ‘feel-like’ lows of between -6C (21.2F) and -10C (14F). 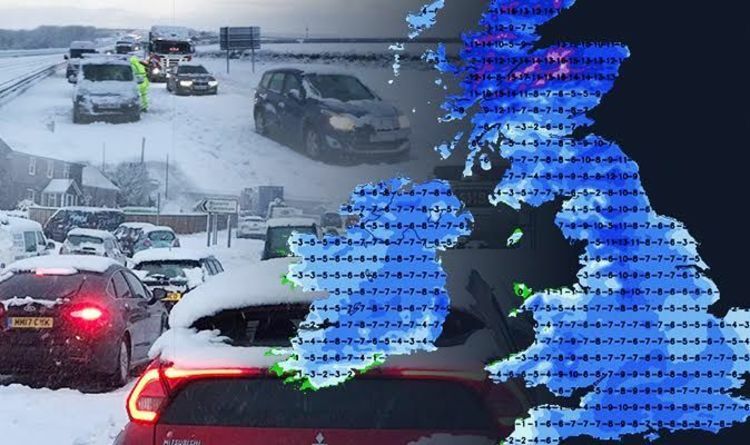 Government forecasters have warned severe weather today threatens yet more chaos on the roads, railways and at airports as the nation braves the most severe winter blast since last year’s Beast from the East. Motoring groups are warning drivers to take extra care as sub-zero temperatures will turn roads into lethal ice rinks. Met Office warnings for snow and ice remain in force across Scotland, the east coast of Britain and southern England this morning. People heading out and about are advised to prepare for delays and widespread disruption with power supplies and mobile phone signals also likely to be affected. A more serious amber warning or snow is in place across Reading; Windsor and Maidenhead; Buckinghamshire; Slough; Wokingham; Hampshire; Surrey; Oxfordshire and West Berkshire. Another two inches of snow is expected to coat these regions by the end of the morning putting rural communities at risk of being cut off. Met Office chief forecaster Dan Suri said: “Some delays and cancellations to rail are likely, and perhaps air travel. “There is a good chance that some rural communities could become cut off. Lashing rain and snow unleashed havoc last night burying parts of Britain under a carpet of white amid warnings of more heavy snow today. AccuWeather forecaster Eric Leister said: “While some areas are still cleaning up snow, another storm already started to impact the UK, bringing the risk of more widespread snowfall through Friday. “Widespread travel impacts are expected into Friday morning. “Residents should prepare now for longer travel times and the potential for school and business closings. UK weather charts show the mercury plunging to -13C (8.6F) in Scotland tomorrow with minimum temperatures of between freezing and -7C (19.4F) across the rest of Britain. The mercury plunged to -15.4C (4.28F) last night making it the coldest night for at least two years and just 0.4C off the coldest since 2010’s -20C (-4F), according to the Met Office. Meteorologist Craig Snell said a bitterly cold weekend awaits with an ongoing risk of snowfall and icy surfaces. He said: “There will be a risk of wintry showers inland over the weekend but these will be more confined to eastern and northern regions. “It will be very cold over the next two days and with snow melt or snow on the ground the main issue is going to be from ice. “Saturday night is going to be another very cold one, we expect temperatures to drop to minus double figures in the north and widely below freezing. Health experts have urged people to continue to take care as severe winter weather grips the country. Sub-zero temperatures could render road grit useless meaning drivers face hazardous conditions on the roads this weekend. RAC Breakdown spokesman Rod Dennis said: “Drivers should remember that salt stops working when road temperatures really plummet. “Below about zero, salt can lose its effectiveness and below -10C it can't prevent roads from freezing in the first place.